We here @ #Outsiders were on the "standby" to receive news of Apple Earnings. From this summary courtesy of the team at the Business Insider BI Intelligence team, it is clear that they continue to hit on all key metrics with one exception: iPAD. As noted in the newsflash, it is quite a development that iMAC shipments overtook iPAD shipments for the quarter. Apple had another great quarter, surpassing estimates for earnings per share, revenue, and iPhone sales. Its EPS came in at $2.33, up 40%, while sales jumped 27% to $58.01 billion. It sold 61.2 million iPhones, a 40% increase from last year. While everything pointed to a solid quarter, there was one category that stood out for its below-expectations number: iPad sales. According the chart below, made by BI Intelligence, Apple sold 12.62 million iPads last quarter, down 23% year-over-year, which translates to roughly $5.43 billion in sales. That's lower than the $5.6 billion the Mac brought in last quarter, marking the first time Mac revenue surpassed iPad revenue. 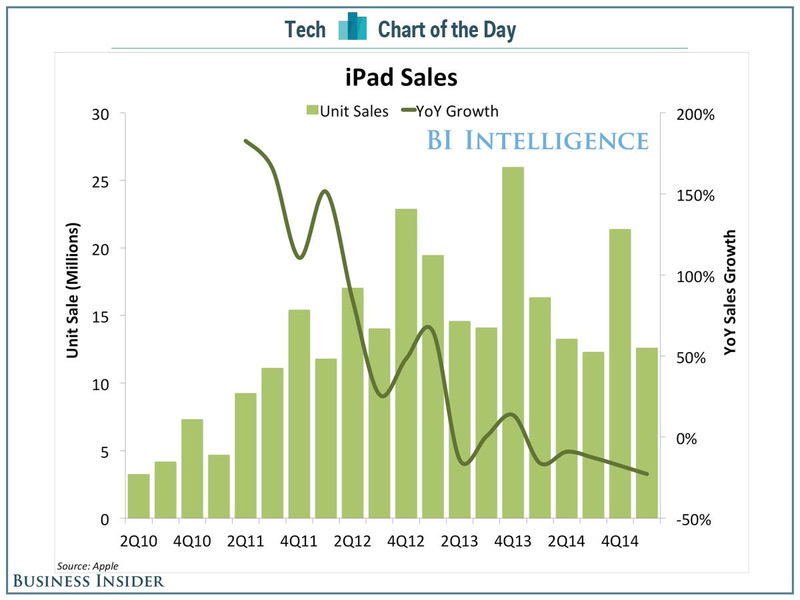 The iPad sales growth has been in steady decline over the past few years. Year-over-year sales have declined in each of the last 8 quarters. There are many reasons for iPad's decline, namely less frequent update cycles than the iPhone, and lower demand due to the bigger sized iPhones. But some analysts also expect iPad sales to jump once Apple's partnership with IBM materializes into bigger enterprise market share.